Audience: 8 – 18, male/female. This would be good to use for small group discussion classes with children of divorce or as an intergenerational class with the children of divorce, their (step)parents, or even grandparents. Although the age range is quite big, their ages are a less important factor than the stage of their crisis in dealing with the divorce (i.e., beginning, midway, after/years later). I would also encourage siblings to take these classes together. I believe it would be helpful for children in the early stages to hear from children in the later stages; alternatively, for targeted discussions it may be useful to divide into “stage” groups as well. 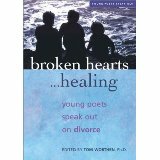 Summary: This collection represents the original works of children ages 9 to 18 that deal with the theme of divorce. The children write primarily in free verse. The editors have divided the book by “sub-themes” which are also useful for targeted discussions. There is a general movement in the arrangement of the poems from despair in the earliest chapters toward hope in the final chapters. Literary elements at work in the story: These are very concrete poems dealing with a specific topic – divorce. The styles vary, but overall they are narrative. There is little abstract work or embellishment, but rather straightforward words of children trying to come to terms with a broken home, that gives this collection impact and weight. The editor’s decision to divide the poems into 16 chapters with titles such as “my heart is broken” and “I once had a family” are very helpful for the reader to be able to hone in on a particular issue for reading or discussion. If read sequentially, the book shows a progression in the poems from the initial shock and upheaval of divorce to some form of acceptance and healing. Perspective on gender/race/culture/economics/abilities: There is an obvious and clear perspective of children whose parents have divorced. Neither race, economic status, gender nor cultures are significant factors in the selection of poems, but rather they are united in their common experience of divorced/divorcing parents. Theology: While divorce is found in the Bible, the concept is understood so differently from our culture that there is little to be gained from those specific passages when it comes to understanding the feeling of devastation that divorce may bring to a child’s life in our time and culture. For children whose lives have been pulled out from under them, they need to know that: 1) it’s okay to be angry with their parents; 2) it’s okay to be angry with God; 3) their parents still love them (perhaps despite all appearances to the contrary); 4) God loves them, always will love them, and is faithful; and 5) God also loves their parents. While I would not normally use a paraphrase of the Bible, in this situation it may be useful to have Peterson’s The Message for use in discussion groups. The Message’s translation may be more accessible for younger children than traditional translations and may resonate more directly with their own feelings of abandonment, guilt and fear. By using the Psalms in tandem with the poems of children of divorce it is easy to see how these emotions (albeit from different circumstances) span the eons and how God is still faithful thousands of years later. By allowing the laments/poems to have their place and to give them full hearing validates the children’s feelings and gives them a safe and hospitable space to say whatever they need to say about their circumstances. By moving out of the laments/poems to the psalms of comfort and praise in correlation to poems from chapters 13-16 [that emphasize that healing is possible (or at least conceivable)] the discussion can move to a place of openness to future healing and peace with the reality of divorce, and place that healing and peace within the context of their faith and their faith community. Faith Talk Questions: These questions are directed to children for use in general discussion groups, but it would also be useful to create questions specifically for sibling groups and parent/child groups using the same concept. When we read the Psalm what do you hear? If we read it with “mom” or “dad” instead of “God” would you think they were writing about your life? Do any of the Psalms remind you of a particular poem you read? In what way? Do you think the Psalmist was angry with God? Why do you think the Psalmists were not afraid to speak to God the way they did? Is it okay for us to speak to God the way they did? To tell God everything we feel in our hearts? To be angry with God about the divorce? Do you think your parent’s divorce made God as sad as you? Why (why not)? Was there a poem that captured how you felt the first time you knew your parents were divorcing? Was there a poem that captures how you feel now? Is it different? In what way have your feelings changed? How do the Psalmists describe God’s relationship to them? How do they describe God? Do you think God loves your parents the same now as when they were married? Why (why not)? Does God love you the same? How do you know? Was there a poem in Chapters 13-18 that gave you hope? How do you think the kid who wrote that poem got to that point? How do you think God could help you find that hope? How do you think the church could help you find that point? By “stages” I am referring to the book’s conceptualization of emotional transitions from the initial shock, to feelings of guilt, feelings of anger/betrayal, hope for reconciliation, and acceptance (to generalize). While these “stages” may occur in quick succession for some children, others may struggle through them for years. Having a child who is closer to acceptance and healing talking with a child who is still in the initial “shock” or betrayal phase may be very helpful. Broken Hearts….Healing by Storypath is licensed under a Creative Commons Attribution-NonCommercial 4.0 International License.